Where would you like to retire? For many of us, the top criteria may be social: we want to be near friends and family. But what if you had the flexibility to pick up and move to a spot that would best ensure a great quality of life? SeniorAdvice.com, an internet service connecting seniors to housing, set out to answer this question. The site developed the SeniorScore livability index to help determine the best cities for senior living. It used more than 100 data points from sources that included a variety of private and government databases, the U.S. Census Bureau, and Medicare. There’s a lot that goes into quality of life, and this score looked at a variety of indicators including weather, population density, public transportation, traffic, and even the quality of public schools. Quality of life also considered the beauty and cleanliness of the environment. Safety is key for residents of all ages, but even more so for seniors. The study looked at statistics on crime and at services to support community safety. In addition, seniors tend to demand access to high-quality health care. For this reason, the study looked at how accessible health care was for seniors, specialty services for older people, as well as the ease of accessing emergency services. A great community for seniors also offers social support and fun. How many activities and programs did each community offer for senior citizens? How many senior citizens live in the community? How many opportunities do retirees have for meaningful and fun social interaction? The study looked at the affordability of an area, considering taxes, home affordability, and overall cost of living. It also took into account financial issues of particular interest to seniors such as the cost of in-home care and senior living facilities. With all these factors in mind, SeniorAdvice came up with its top ten cities for senior living. Does your city make the list? Oklahoma City ranked first among large US cities. Its large number of Medicare registered physicians and whopping 25 hospitals in or near the city gave it a high grade for health and safety. With 114 senior living facilities and numerous providers of home health care, it provides many options for residents in their golden years. Despite high marks for water quality and climate, the city did lose some points for its crime rate. 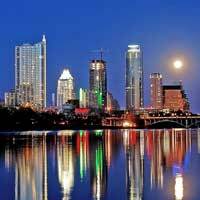 Austin boasts mild winters, good water quality and ideal temperatures year round. Nevertheless, its score was impacted by higher taxes and cost of living. Austin’s score was boosted by having no state income tax and by a higher-than-average household income. Pittsburgh scored well in the recreation and leisure category due to a variety of recreational opportunities, including 125 golf courses and 34 parks in and around the city. However the city's quality of life score was impacted by below average grades for climate and poor air quality. With lower than average property and sales taxes and reasonable costs for nursing homes and assisted living facilities, Louisville ranked high in the finances category. However, the score was negatively affected by higher crime rates. Louisville scored well in the health category, with 103 senior living facilities and ample Medicare-registered physicians. Fort Worth is attractive for seniors due to its low rainfall levels and mild winters. The overall cost of living and home health costs are low. However, property taxes are high, and assisted living costs tend to be higher than average, as well. Residents of Richmond have a higher than normal life expectancy of 78.6 years. The city boasts high marks for safety and health, with plenty of home health care providers. Nevertheless, it costs more than average for seniors to live in the city, with an overall higher cost of living and a more expensive price tag for nursing homes and assisted living. When it comes to social attributes, St. Louis scored high, with many religious congregations in and around the city. The city is senior friendly with plenty of reasonably priced senior living facilities. St. Louis’s score was held back by higher crime rates, however. Omaha seniors have a higher than average life expectancy of 79.8 years, supported by numerous home health care providers and Medicare-registered physicians. However, the overall lower cost of the living for the city is offset by higher than average costs for health services for seniors. With 52 parks, 103 golf courses, and 43 malls, Cincinnati has plenty of opportunities for senior recreation. Cincinnati also boasts a high number of Medicare-registered physicians and senior living facilities. On the downside, higher crime rates negatively impacted the city’s score. Higher costs for nursing homes and assisted living facilities also lowered the city’s overall score. San Antonio gets high marks for quality of life, with pleasant seasons and mild winters. The social scene is active for senior, thanks to San Antonio’s large population of retired military personnel. Nevertheless, high costs for property and sales tax as well as expensive assisted living facilities brought the score down in the finance category. Whether or not you’re planning to relocate, covering your living expenses and having money left over to enjoy may still be a consideration. Guaranteed annuity income can help ensure you meet these expenses and have a worry-free retirement. If you’re interested in seeing how much guaranteed income an annuity could provide, use the blue calculator to see get instant annuity quotes. You’ll see real payout rates from top annuity providers. It’s fast, free, and there is no obligation.